Birmingham City, along with many other clubs, paused to remember and honour Nelson Mandela before the game this weekend. This was very appropriate. He was a man who realised that sport could be used to bring people together. Before 1995, South African rugby was seen as a white man’s sport and the springbok emblem as a symbol of apartheid. When the Rugby World Cup was played in South Africa, Mandela urged South Africans of all races to support the national rugby team. He helped to unite his country by putting on a Springbok jersey and cap. At St Andrews, we honoured Mandela by clapping for a minute before the game. It would also be good to honour him by trying to follow his example in some small way. Maybe by showing a bit more forgiveness towards those who have wronged us? Or to our manager and players when performances are poor? In contrast to the generous spirit of Mandela, there are numerous instances of greed in football and a widening gap between the haves and the have-nots. For example, I noted some more comment about feeder clubs recently. Edward Woodward thinks they are a good idea1. That’s not surprising; he is the executive vice-chairman of Manchester United. So he is considering the topic from the point of view of a big club and it could be advantageous for Manchester United to have a feeder club where its young talent could play. Daniel, on Often Partisan, thinks that feeder clubs are a bad idea and could widen the gap between the big clubs and the rest2. I agree with Daniel on this. 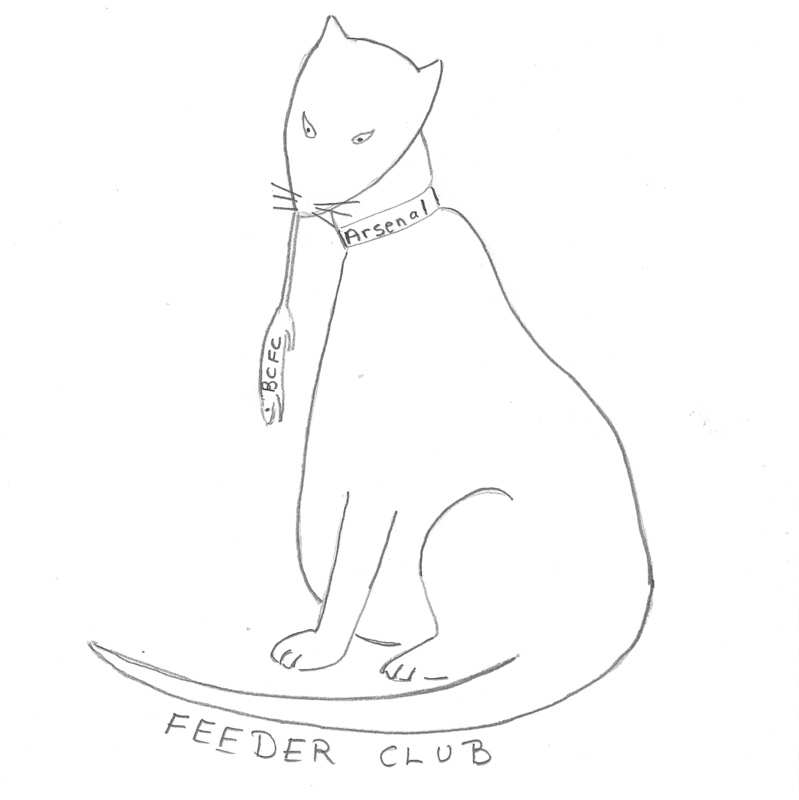 The phrase ‘feeder club’ gives rise to a very disturbing image in my mind, an image of fat cats and … Well, maybe an image, even a poorly drawn one, may explain more than words. This entry was posted in Birmingham City FC, Football, Life in general and tagged Birmingham City F.C., Feeder clubs, Football, Nelson Mandela on December 8, 2013 by Puddleglum.